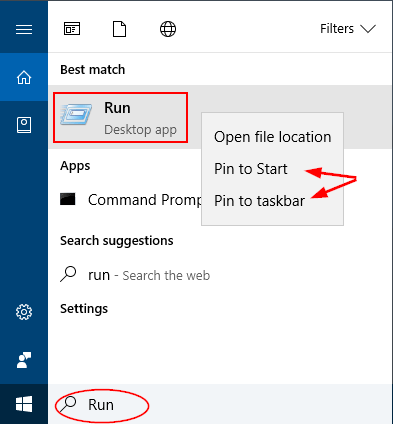 Using the Run command in Windows, you can run quick commands and programs, open folders or files, etc. 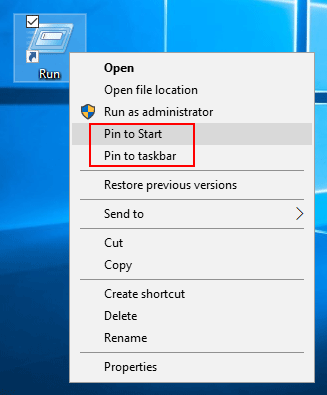 In previous post we’ve covered all kinds of ways to open the Run command box, here we’re going to show you how to create a Run shortcut on Windows 10 desktop. 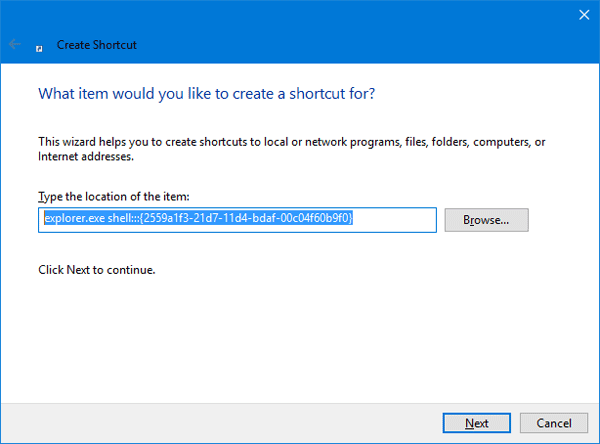 How to Create a Run Shortcut on Windows 10 Desktop? 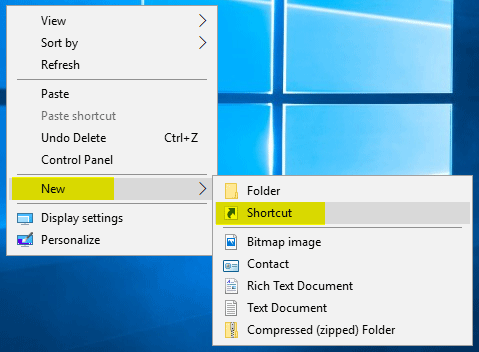 Right-click any empty area on the desktop and select New > Shortcut. 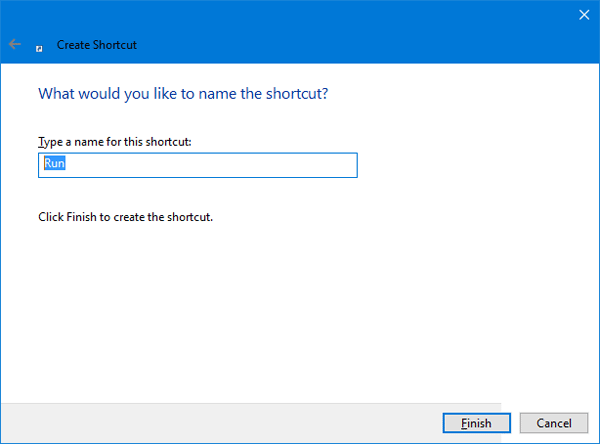 This will open the Create Shortcut wizard. Copy and paste the location below into the location area, and then click Next. Name the shortcut as ‘Run‘ and click Finish. The default icon for your newly created shortcut is a folder icon. 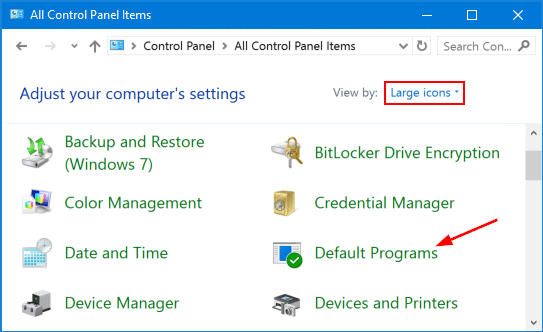 To change the icon, right-click on the new Run shortcut on the desktop, and then select Properties from the context menu. Under the Shortcut tab, click the Change icon button. In the Change Icon window, browse to select the file C:\Windows\System32\imageres.dll. 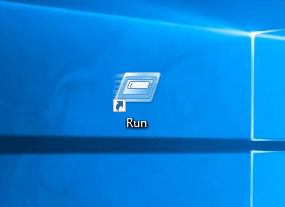 Next choose the Run command icon and click OK.
Now, the Run shortcut should now show up on the desktop with the original Run command icon. You can double-click on it to open Run command box for quick access. 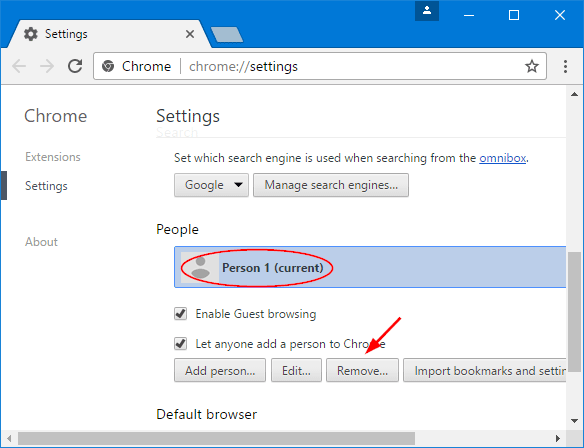 Have you messed up with your Chrome profile settings? 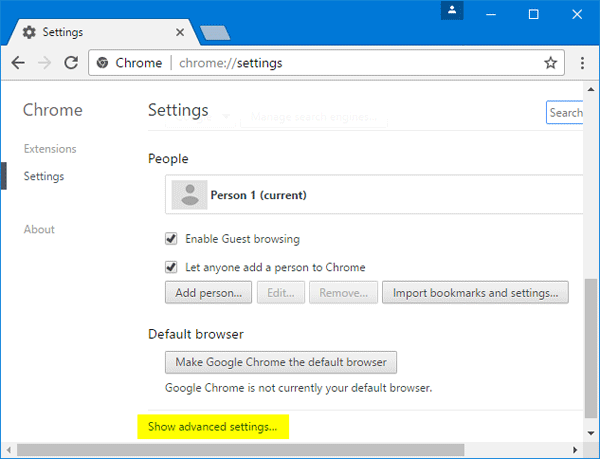 Chrome is running slow and you have adware or pop-up ads problems? 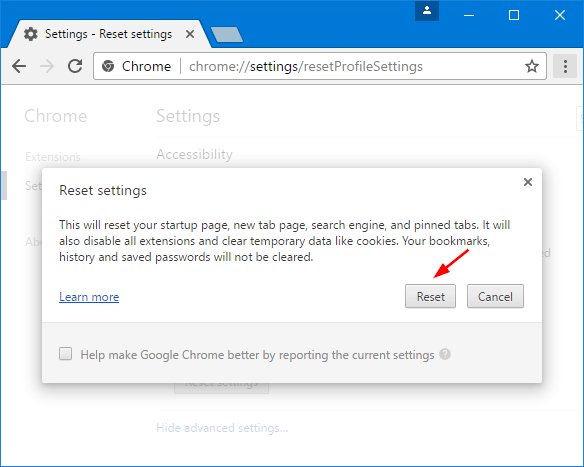 In this tutorial we’ll show you 2 ways to reset your Google Chrome settings and data to default without reinstall. 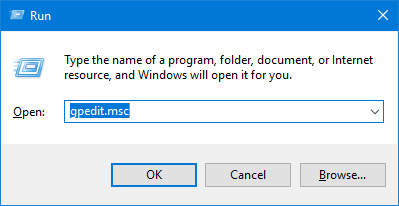 If you’ve installed Windows 10 Creators Update (build 1703), you may find that Command Prompt is missing from the context menu when you press WIN + X shortcut keys. Microsoft has replaced it with PowerShell, which is a bit annoying if you are a fan of Command Prompt. 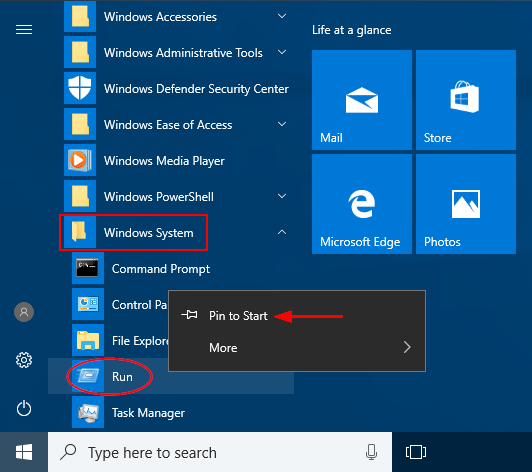 In this tutorial we’ll show you how to replace PowerShell with Command Prompt in Windows 10, so you can access Command Prompt in the Win + X menu again. 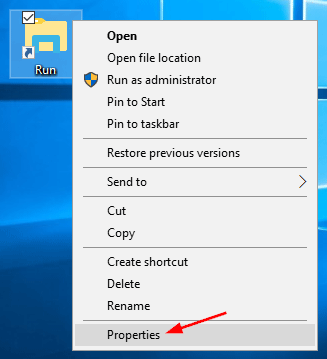 How to Restore Missing Command Prompt to Win+X Menu in Windows 10? 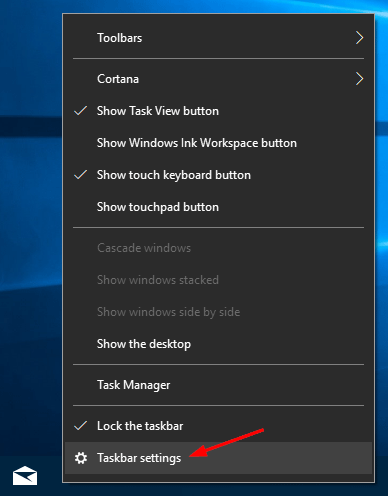 Right-click on any empty space on the taskbar, select Taskbar settings (or “Settings” for earlier build of Windows 10) from the context menu. 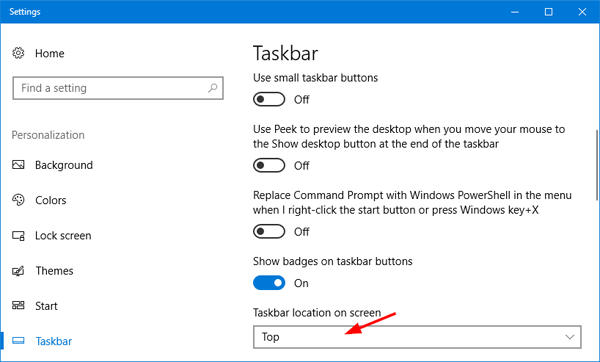 The Settings app will be opened directly at the Taskbar page. 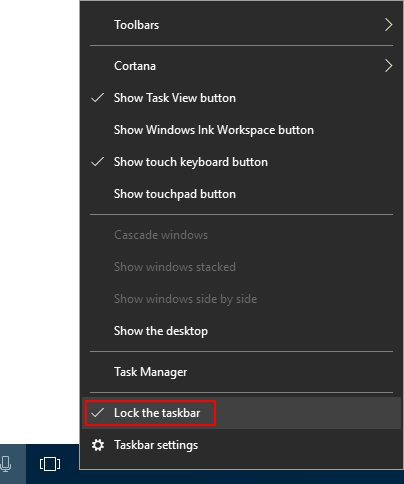 Turn the “Replace Command Prompt with Windows PowerShell in the menu when I right-click the Start button or press Windows key+X” option to Off. This change will take effect immediately. 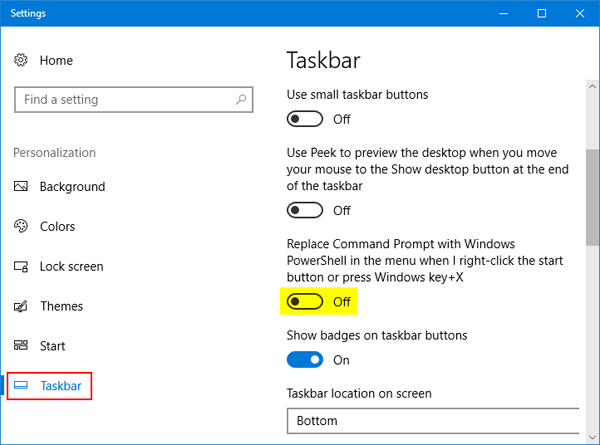 When you right-click the Start button, or hit the Windows + X keyboard shortcut, the Power User Menu will pop up as usual but the PowerShell will be replaced with Command Prompt. That’s it! When you roll the mouse wheel one notch, a webpage or a document will be scrolled up or down 3 lines. If this default scroll speed is too slow for you, you can increase the mouse wheel scrolling speed in Windows 10 and make it scroll one screen at a time. 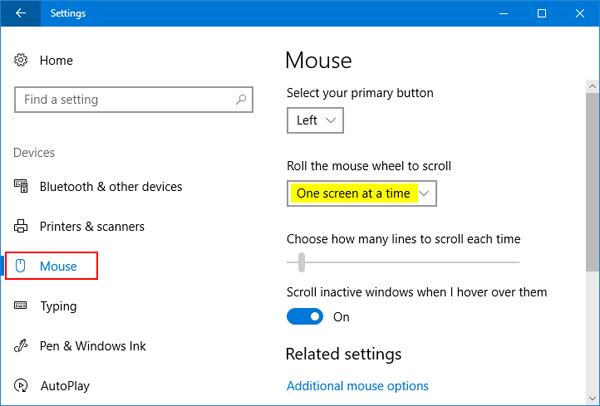 How to Set Mouse Wheel to Scroll One Screen at A Time in Windows 10? 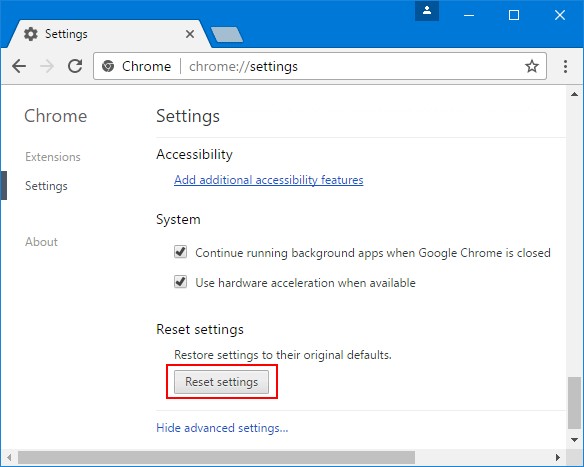 To change mouse wheel scroll speed, you need to access the Settings app. 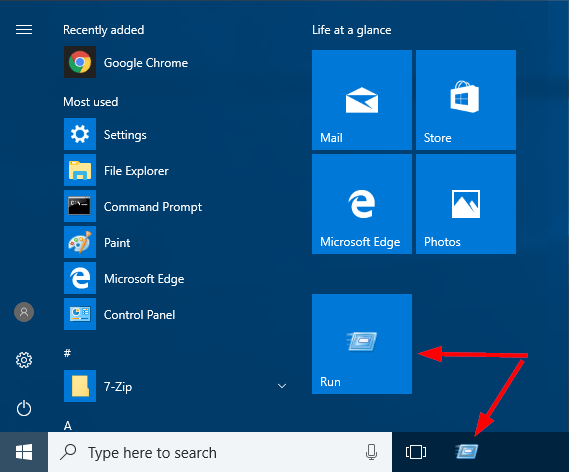 To do so, click the Settings icon from Windows 10 Start Menu, or press the Windows + I keyboard shortcut to open the app. When the Settings app launches, click on Devices. Choose Mouse on the left, you’ll see various mouse configuration settings. 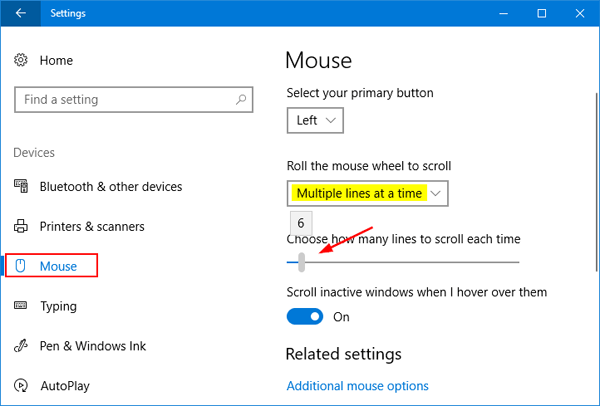 Under the “Roll the mouse wheel to scroll” setting, you can choose between “Multiple lines at a time” or “One screen at a time“. The first is the default setting, which makes scrolling smoother and slower. If you choose the “Multiple lines at a time” option, you can use the slider underneath to choose the number of lines that are moved up/down with each notch of the wheel. If you choose the “One screen at a time” option, the slider below will gray out and when I roll the mouse wheel one click, the wheel will skip an entire page of content at once, rather than going through it line by line. This setting is drastic if you have a large monitor with a high resolution. 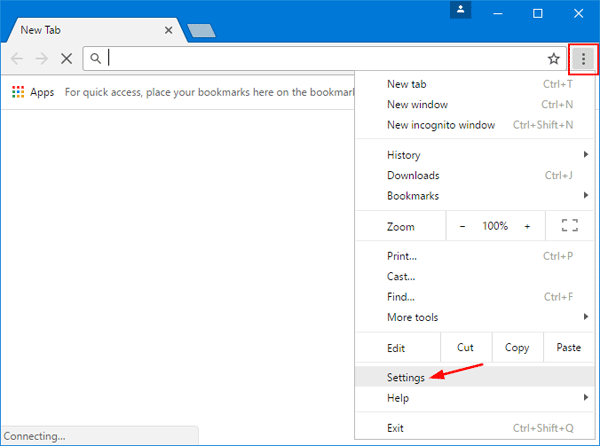 After changing the mouse wheel scroll settings, you can open a webpage or a document, and check which scrolling method you prefer, and adjust the scroll speed to what you want. Is there a way to pause the downloading update without having to turn off completely the Windows updates? Sometimes Windows will force you to start downloading the critical updates, even when you use a mobile internet with slow and strict traffic limits. 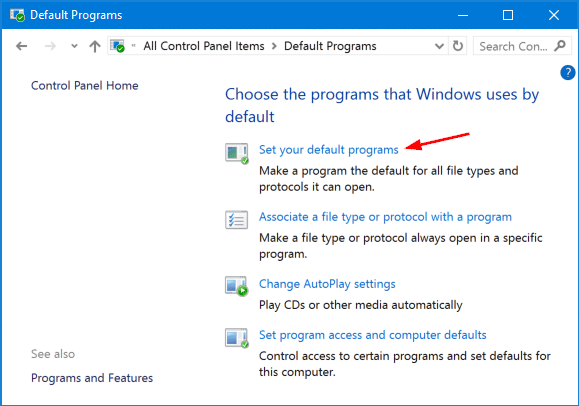 In this tutorial we’ll show you a simple way to pause a Windows Update download while in progress, so you can resume it later. How to Pause the Windows Update Download in Progress? 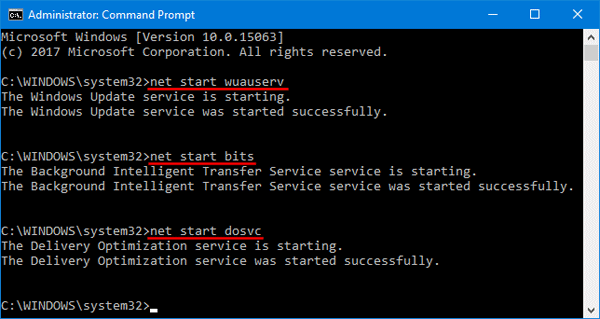 To start, you need to open the Command Prompt as administrator. To do so, press the Windows key + X on your keyboard and select Command Prompt (Admin). 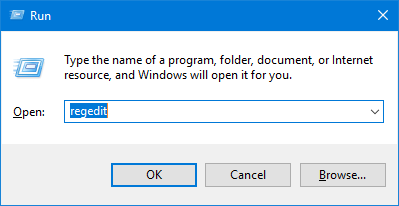 Click Yes when you see the UAC prompt. You’ve now successfully paused all the Windows update downloads. Whenever you want to resume the download, simply execute the below commands one by one, press Enter after each. You can also turn on the Metered Connection feature in Windows 10 to stop automatic updates. However, this command line method is the most direct way to pause and resume Windows Update downloads while in progress. 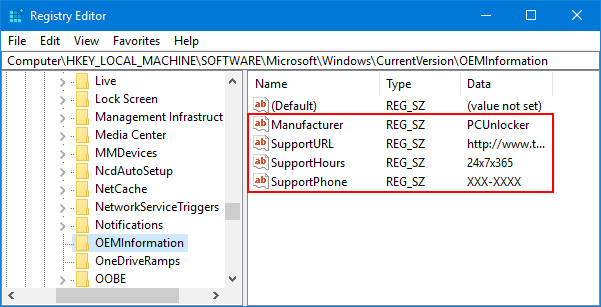 Windows 10 allows you to add OEM support information in the System Properties. The OEM information includes your company name, phone number, website URL, and even a custom logo. In this tutorial you’ll learn how to easily add OEM support information to a Windows 10 computer, with the sole purpose of assisting customers. 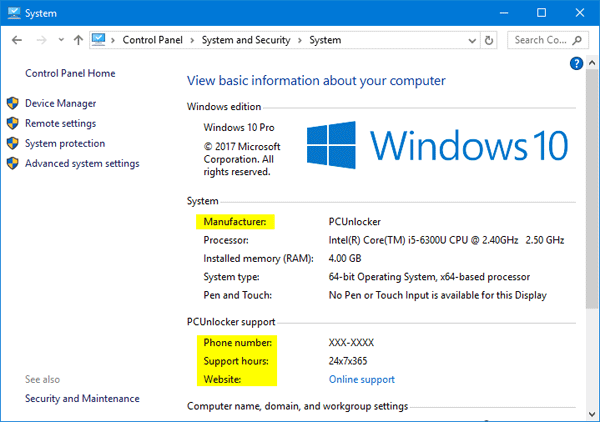 How to Add OEM Support Information to Your Windows 10 Computer? 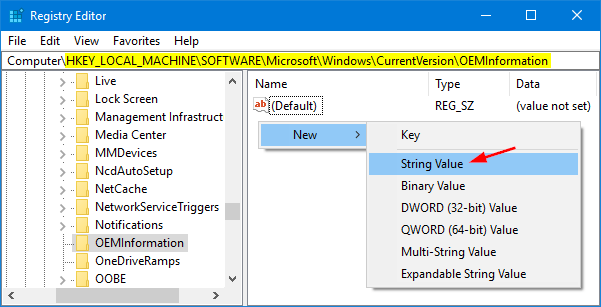 With the OEMInformation key selected on the left, right-click any empty space on the right side and choose New > String Value. Name the new value as Manufacturer, and then change its value to your company name or the vendor’s name. Repeat the above step to add other OEM support information: Model, SupportHours, SupportPhone, SupportURL, Logo. The logo must be a BMP image file and cannot be bigger than 120×120 pixels in size. 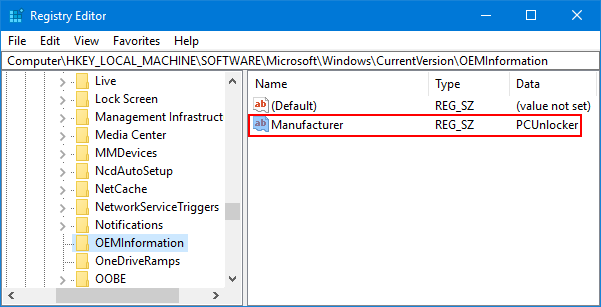 Now open System Properties by right-clicking on This PC icon on the desktop and selecting Properties, you’ll see your customized Manufacturer information listed under the System section. If you add a support telephone number or website, they’ll appear in a separate Support section of the window. 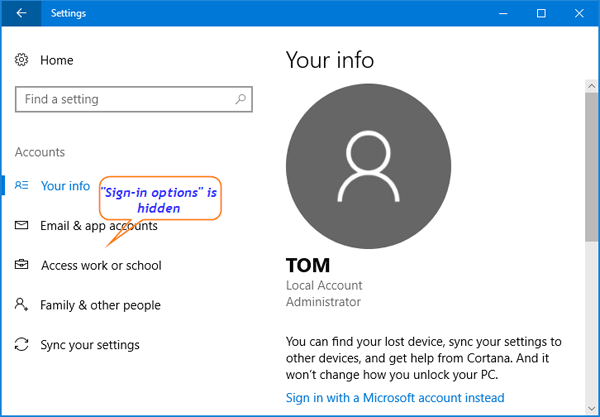 With these simple steps, you can add completely custom OEM support information to a Windows 10 PC. This can come in handy if you’re building PCs for others, or if you just want to add a unique and custom aspect to your system. 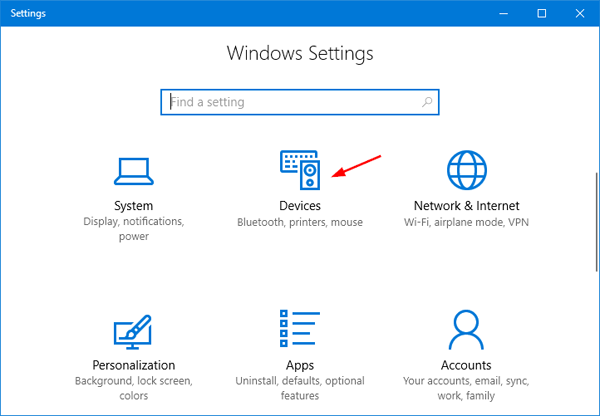 In Windows 10, most Control Panel features have been moved to the Settings app, and Settings will eventually replace the Control Panel. 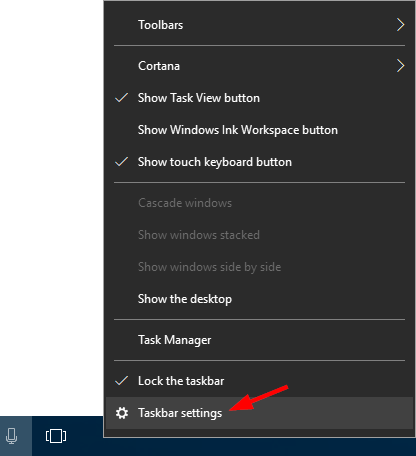 Starting with Windows 10 Creators Update (build 1703), there is a new feature that allows you to hide certain pages of the Settings app. 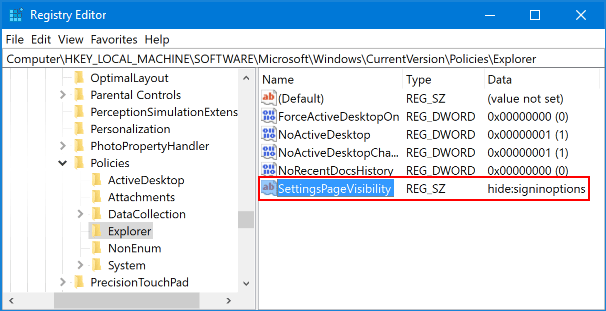 In this tutorial we’ll show you how to use group policy or registry editor to hide certain or all pages of the Settings app in Windows 10. Press Windows + R keys together on your keyboard, then type gpedit.msc and press Enter. When the Local Group Policy Editor opens, navigate to: Computer Configuration > Administrative Templates > Control Panel. 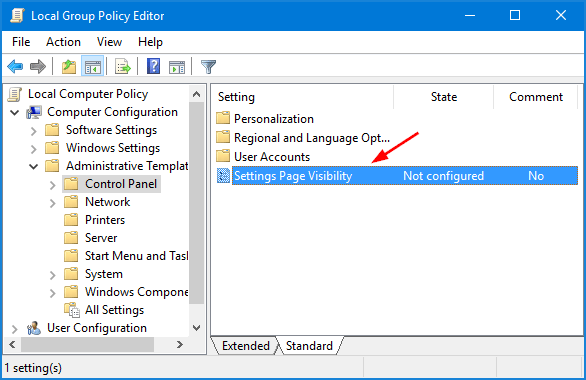 In the right pane, you will find the option named Settings Page Visibility. 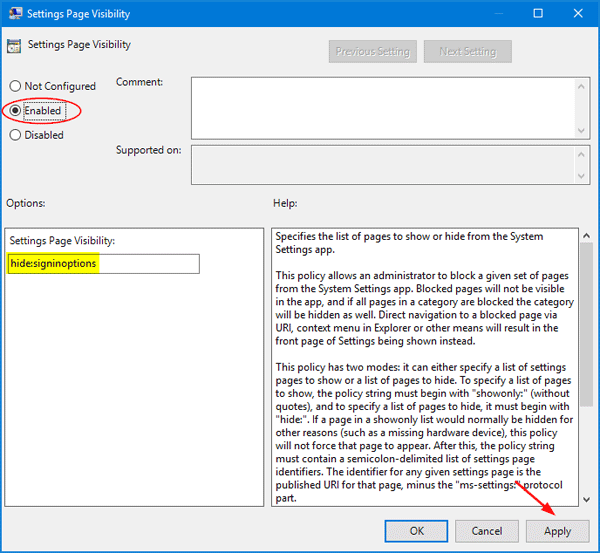 It is a new policy in Windows 10 Creators Update. Note: signinoptions is the URI of the Sign-in options page. To look up URIs for every pages of the Settings app, please check this article. Next click Apply and then OK. Re-open the Settings app to check if it takes effects. In my case, the Sign-in options page is disappeared. Press Windows + R keys together on your keyboard, then type regedit and press Enter. If you don’t see the Explorer key, then just create it yourself. 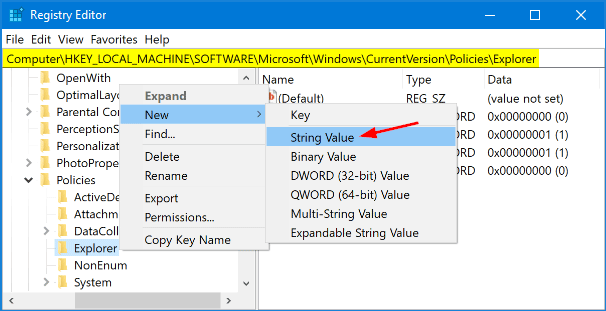 Right-click on the Explorer key in the left pane, and then select New > String Value. Name the value as SettingsPageVisibility. Close Registry Editor and relaunch the Settings app to see the changes. 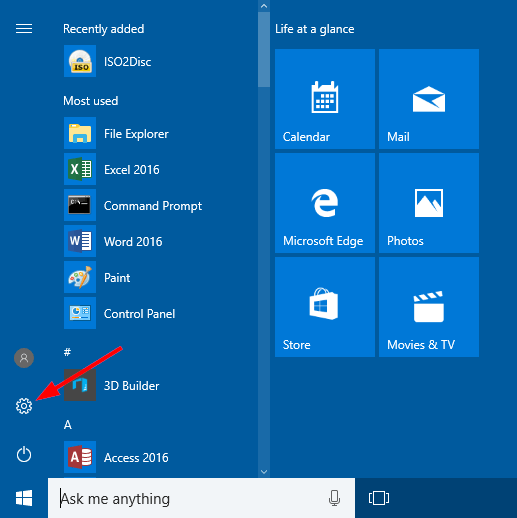 Just upgrade to Windows 10 and find Windows Photo Viewer is missing from right-click context menu? 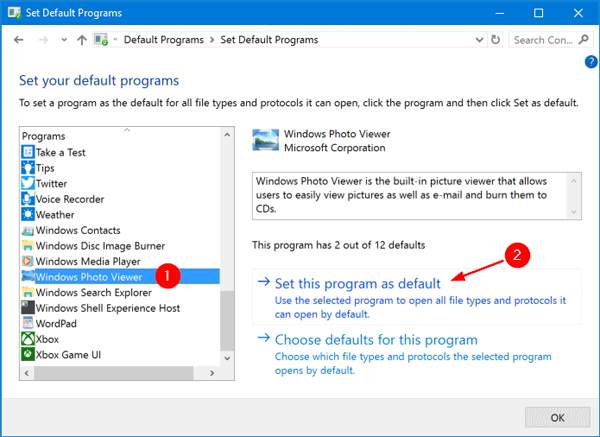 Windows 10 comes with a new default image viewer app – Photos, which is meant to replace the old Windows Photo Viewer. 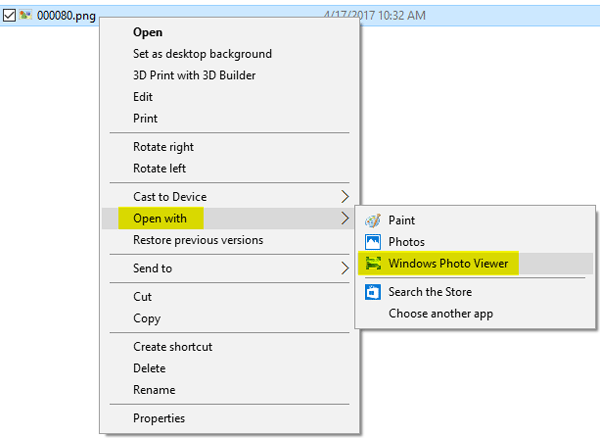 Though Windows Photo Viewer hasn’t been removed from Windows 10. It’s just hiding so well you might never ever find it. 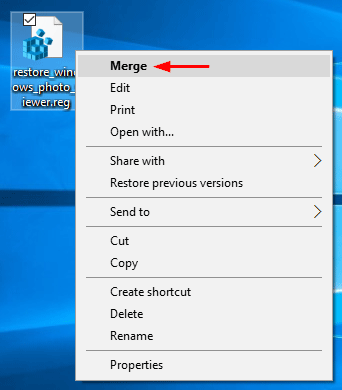 In this tutorial we’ll show you how to restore missing Windows Photo Viewer in Windows 10, and set Windows Photo Viewer as default image viewer. To get started, download the restore_windows_photo_viewer.reg file and save it to your Windows 10 computer. Next, right-click this file and select Merge. If prompted by UAC, click on Yes. This will register Windows Photo Viewer with Default Programs, and associate all image files types (.jpg, .jpeg, .bmp, .png, .tif, .dib, etc) to Windows Photo Viewer. Now, right-click on an image and select Open with from the context menu, you can then click Windows Photo Viewer to view your image. Open the Control Panel. Set the View by option to Large icons and then click Default Programs. Select Windows Photo Viewer from the list, and then click Set this program as default on the right-hand side. 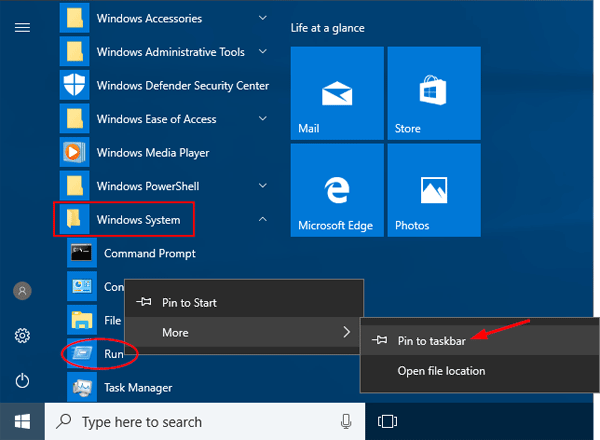 Now, double-click on any image files and Windows 10 will open them with Windows Photo Viewer by default.